Youth unemployment becomes a challenge for governments and a nightmare for youth. Youth unemployment remains a barrier for the young generation in Africa and Europe. More than 75 million young people are unemployed internationally; this number is getting bigger in Africa, as it remains the youngest continent of the world with the highest number of unemployment among youth. This large unemployed youth population indicates lost development potential since governments fail to benefit from the young people’s contribution. Also, difficulties in finding and sustaining decent employment diminish from a young person’s lifetime productivity, which makes it even more challenging to face poverty, hunger, health issues and more social and economic issues. 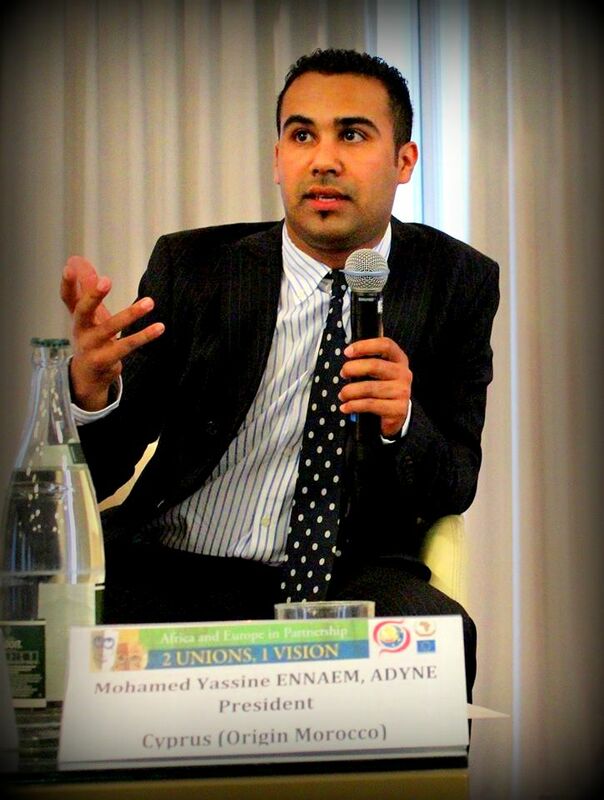 I caught up with Mr. Yassine Mohamed Ennaem, President of ADYNE (African Diaspora Youth Network in Europe) to get his opinion on the subject. Sana: First, thank you Mr. Yassine for taking the time to chat with us, we imagine how busy you are, and we’ve been informed that you will take part of the “African Diaspora Forum in Europe” this June as a Keynote Speaker, can you share with us a brief background of the work you do? Sana: Amazing, as you know the forum is tackling a very challenging topic which is the youth unemployment among Africans living in the Diaspora, based on your case and in addition for being active in the Diaspora, you are also recognized as shifting example to the national development scale, how would you describe the current situation of Africans in Diaspora in Europe? Mr. Yassine: To be fair, the youth unemployment nowadays is a challenge faced by all Youth in Europe, therefore we cannot connect it to people with African background only, though there are cases where people with African background did not have equal opportunities as others, I would say that this is not the rule, it remains a culture that will probably take sometimes to overtake it and the best way to face this issue is by being more competitive, youth with African background in many cases they should be better than others to be given a job, if they are just equal they are not given the priority unfortunately. It is true that most of the first generation of Africans that came to Europe, came to do jobs that Europeans did not want to do at that time, but today the situation has changed, as we have reached 5th & 6th generations of African Diaspora in Europe, the new generations are educated and as qualified as the rest. We must acknowledge that the Diaspora is a phenomenon of our times, the Diaspora represents a huge potential for the states, and it is outstandingly situated to contribute to the boosting of the economic growth and opulence in Africa and Europe. I hope this Forum will serve as a starting point for solutions to these related issues that will bring huge opportunities for both continents on different levels. Sana: VAS Organization is preparing a huge forum that will gather leaders, experts, international organizations an over 200 participants from all over the Diaspora and the world, representing different organizations and groups, the objective behind is to create a bridge of connection. What are your expectations for the Afro-Euro cooperation? Mr. Yassine: The Afro-Euro cooperation is something that has existed on papers for long time, and it remained as a wish and promise, today this vision should be an action rather than a wish and a promise, and it should be based on mutual respect and mutual benefits and the two continents have the resources and the capitals to make it a win/win case. Sana: Very powerful, in one sentence what is your best advice for youth taking part in this forum this year? Mr. Yassine: The world is changing, and we all need to learn how to adjust, and by saying all I don’t mean the African diaspora only. I also believe that youth should not only think of finding jobs, but they should think out of the box and try to create jobs. Sana: Wow, very inspiring, thank you for your time. See you in Vienna! Mr. Yassine: Thank to you Sana for having me, special thanks to VAS and all the team working hard on organizing the Forum, See you in Vienna! Meanwhile, this year VAS organization is tackling its actions and attention to bring in innovation approaches for youth and governments to face the situation of unemployment, by providing youth a platform where they can improve their expertise and knowledge to meet the needs of the job market. VAS organization organizes an annual event where both leaders of the world and youth meet to discuss and work on ways to create solutions and opportunities for young generation to be a development contributor. 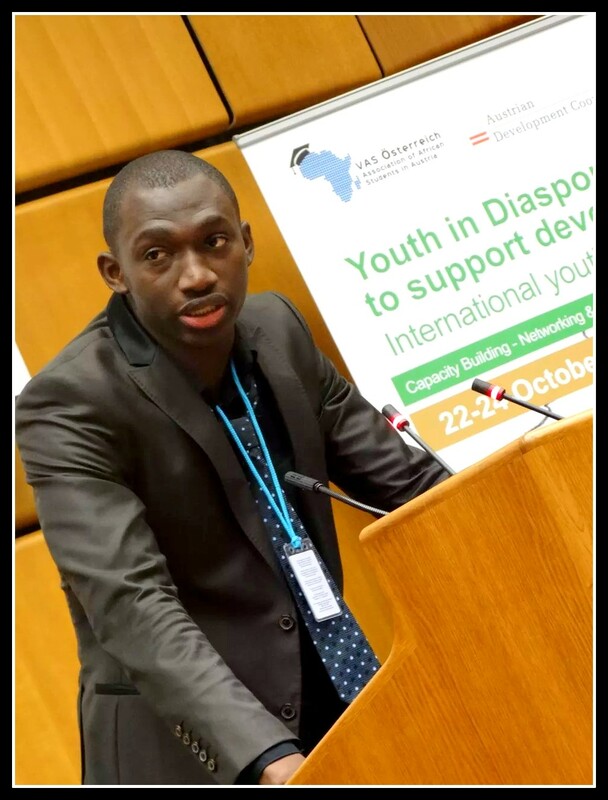 From Vienna, Mr. Ibrahima Djiguine, representative of VAS organization and the Co-project manager of this year event. Sana caught up with Mr. Ibrahim for a brief chat, ahead of the forum in Vienna. Sana: First, thank you Mr. Ibrahim for taking the time to chat with us, it must be a very busy period now for you as the forum date is approaching, and let me congratulate you on being a model for Africans living in the Diaspora. Out of the many Africans, you have been chosen by VAS organization as successful model I believe it’s because of a proven record of hard work in enhancing the African development. Can you share a brief background of the work you do? Mr. Ibrahim: Thank you Sana for this opportunity to share my thoughts with you. Our mission is to create a suitable environment for academic success, promotion of culture, encourage entrepreneurship and solidarity for positive change. I have been since a year now a member of VAS and I was the co project manager of last year’ International Youth Conference. Our work involves different fields of activities with different projects. We organize Forums and conferences with the goal of organizing and empowering the Youth to join growing movement and raising awareness on tackling the challenges faced by the Diaspora living in Europe. We cooperate in a network with other organizations and experts from the African Youth, Youth in general and other important stakeholders all over the world. Our recent focus in the latest conference was capacity building, coordination of projects, networking and cooperation. Sana: What are your challenges and best success story as African living in the Diaspora? Mr. Ibrahim: There are many challenges involved in finding opportunities to investment, employment and most of all room for creative entrepreneurs to start new businesses for sustainable growth in Africa. We try our best to motivate millions of Diaspora to invest their Finance back home and contribute their skills to the advance. Fostering entrepreneurship and innovation for sustainable development of our countries is our ambitions and this is not found to be easy not only for Africa but other parts of the world. However through our training programs and workshops we discuss ways how the Diaspora can participate in the development of our countries mainly in policy making and decision making levels. Sana: As an active symbol of African in the Diaspora, how would you describe the current situation of Africans in Diaspora in your home country, and how do you manage to contribute in the development of your country? Mr. Ibrahim: To answer this question I will start by mentioning that I have good feeling in general about how the Diaspora currently contribute to the advancement of their countries. I strongly believe that the African Diaspora’s contribution as agents of Africa’s socioeconomic change should not be measured merely in financial terms, but as inputs of skilled labor and by its ability to build bridges between countries of origin and destination which help stimulate, not only economic activity, but transfers of knowledge and cultural and social norms. There are several ways in which I participate to the development of my country. These ways include promoting development: Through innovation, broad based networks I am taking my love for Africa and applying it with ingenuity for good. Contribute to the increasingly irrefutable evidence and recognition of the value that the African Diaspora brings to development efforts at home. Sana: VAS Organization is preparing a huge forum that will gather over 200 participants from all over the Diaspora and the world, representing different organizations and groups. What is your best advice for them? Mr. Ibrahim: As this is a continuation of last year’s international youth conference which was an outstanding one, I invite all the youth to come and have the opportunity to meet and share ideas with experts as well as networking and working closely together in order to coordinate international dialogue amongst important stakeholders for African development. Sana: What are your expectations for the “African Diaspora Youth Forum in Europe”? Create new opportunities to boost the social responsibility, integration and social entrepreneurship by enhancing Africa/Europe Youth Cooperation projects. Sana: Very exciting, I have no doubt that VAS forum will be successful. Thank you for your time. See you in Vienna! Mr. Ibrahim: Thank you for having me! If women’s entrepreneurship was not only a female Agenda! Message…It would be very quite good to arrange action now for owners of cards where all clubmen could get acquainted alive. Of course, this quite https://essaycool.com/ large number of people and, and not everything are interesting to all, but it seems logical that if there are cards and some idea of closeness of club, once opportunity creates in order that people at least recognized each other by sight. The most banal option which comes to mind to me – something like blitz acquaintances in a business format in any large coffee house. But I don’t insist at all on this format if only the fact of acquaintance took place. Generally, to create community together it is remarkable, only let it won’t be faceless.